Vittecoq M, Elguero E, Lafferty KD, Roche B, Brodeur J, Gauthier-Clerc M, Missé D, Thomas F.
The incidence of adult brain cancer was previously shown to be higher in countries where the parasite Toxoplasma gondii is common, suggesting that this brain protozoan could potentially increase the risk of tumor formation. Using countries as replicates has, however, several potential confounding factors, particularly because detection rates vary with country wealth. Using an independent dataset entirely within France, we further establish the significance of the association between T. gondii and brain cancer and find additional demographic resolution. In adult age classes 55years and older, regional mortality rates due to brain cancer correlated positively with the local seroprevalence of T. gondii. This effect was particularly strong for men. While this novel evidence of a significant statistical association between T. gondii infection and brain cancer does not demonstrate causation, these results suggest that investigations at the scale of the individual are merited. Toxoplasma gondii is the most common protozoan parasite in developed nations and up to 80% of the population may be infected, depending on eating habits and exposure to cats. After the initial acute infection, the latent and dormant form of T. gondii is found predominantly in nervous and muscle tissues in infected people. Until recently, latent infections in humans were assumed to be asymptomatic but personality profiles, behavior, and psychomotor performance tells a different story. The evidence accumulating is indeed a bit frightening. 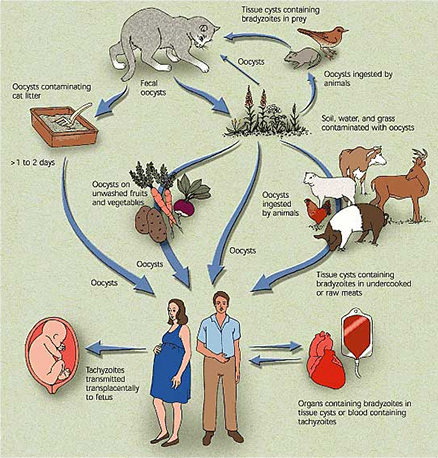 After a short phase of acute toxoplasmosis the infection proceeds into its latent phase when cysts are formed and these survive for the rest of the host’s life, mainly in neural and muscular tissues. In immunocompetent human subjects the latent phase of infection is usually considered asymptomatic and harmless . Toxoplasma is known to induce specific behavioural changes in infected rodents. Observed decreases in motor performance , learning capacity , neophobia , and fear , and increases in activity [7,8], and reaction times  are usually considered evolutionary adaptations of the parasite that facilitate the transmission from intermediate to definitive host (typically from rodents to cat) by predation . Human latent toxoplasmosis leads to prolongation of reaction times  and changes in personality profiles [12,13]. These changes are probably side effects either of the rodent-aimed manipulative activity of Toxoplasma or of some pathogenic activity of the parasites in the brain. The changes cannot influence the risk of predation in modern humans; nevertheless, prolongation of reaction times could increase the risk of other incidents such as traffic accidents. If this is true then the prevalence of toxoplasmosis in participants in traffic accidents should be higher than in the general population living in the same area. Some extremely nice work has been done by a group at Leeds in the UK, who are looking at the Toxo genome, and we’re picking up on this collaboratively. Okay, Toxo, it’s a protozoan parasite. Toxo and mammals had a common ancestor, and the last they did was God knows, billions of years ago. And you look in the Toxo genome, and it’s got two versions of the gene called tyrosine hydroxylase. And if you were a neuro-chemistry type, you would be leaping up in shock and excitement at this point. Tyrosine hydroxylase is the critical enzyme for making dopamine: the neurotransmitter in the brain that’s all about reward and anticipation of reward. Cocaine works on the dopamine system, all sorts of other euphoriants do. Dopamine is about pleasure, attraction and anticipation. And the Toxo genome has the mammalian gene for making the stuff. It’s got a little tail on the gene that targets, specifies, that when this is turned into the actual enzyme, it gets secreted out of the Toxo and into neurons. This parasite doesn’t need to learn how to make neurons act as if they are pleasurably anticipatory; it takes over the brain chemistry of it all on its own. Of course, at this point, you say well, what about other species? What does Toxo do to humans? And there’s some interesting stuff there that’s reminiscent of what’s going on in rodents. Clinical dogma is you first get a Toxo infection. If you’re pregnant, it gets into the fetal nervous system, a huge disaster. Otherwise, if you get a Toxo infection, it has phases of inflammation, but eventually it goes into this latent asymptomatic stage, which is when these cysts form in the brain. Which is, in a rat, when it stops being anything boring like asymptomatic, and when the behavior starts occurring. Interestingly, that’s when the parasite starts making this tyrosine hydroxylase. What is the bottom line on this? Well, it depends; if you want to overcome some of your inhibitions, Toxo might be a very good thing to have in your system. Not surprisingly, ever since we started studying Toxo in my lab, every lab meeting we sit around speculating about which people in the lab are Toxo-infected, and that might have something to do with one’s level of recklessness. Who knows? It’s very interesting stuff, though. Yes and there is an increased incidence of traffic accidents in Toxoplasma-infected military drivers. I hate bugs like toxo and the more I research, the more I find out how odd diseases and behaviors have a bug component. Mary, you and your friend will benefit enormously by reading “Primal Body, Primal Mind” by Nora Gedgaudas. It is very well researched and synthesized, fun to read and extremely insightful. Eliminating gluten is a key in schizophrenia and neurological changes reversed if eliminated in time. Thanks for sharing.